It was barrel madness earlier this week, with dozens of tuna over 100kg showing up seemingly overnight down the coast. The boat ramp at Portland was inundated with anglers returning to weigh their catches on Monday after reports of as many as 30 barrels caught and many more hooked and lost on the one day alone. Among those to get a barrel in the boat was Cameron Lugg while fishing off Cape Bridgewater with Brent Telenius. They were trolling skirted lures in 100ms of water when they experienced a double hook up at 9am when each began fighting a fish. 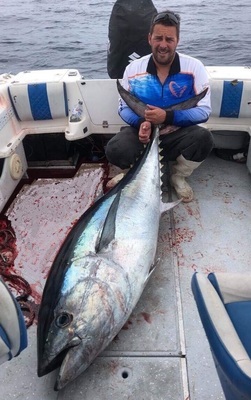 Unfortunately, Brent’s wind-on leader gave way at the side of the boat but Cameron boated his 110kg fish after a two-hour fight on 24kg gear. Jordan Watts managed a barrel on the same day from the same area, also while trolling a skirt over water from 80m to 120, deep. From all reports, most the fish were taken on skirts in a number of different colours. Closer to home, school tuna remained present along the coast. Anglers fishing anywhere from Anglesea to Lorne caught fish around 15kg while trolling small white squid skirts or, on calm enough days. Casing stick bait lures or seven-inch Gulp jerk shads in pearl white to feeding schools of fish. The odd kingfish can still be expected in similar area, along with big Australian salmon. Mulloway were caught throughout the Barwon River estuary but were hit and miss. Most reports suggested that fishing after dark on a tide change gave the best chance of a catching mulloway potentially over a meter, with pilchards or fresh squid the best baits. Surf fishing produced gummy shark and even snapper to 3.5kg. Jan Juc and Bancoora beaches were good locations, especially after dark. Surf anglers who did well generally arrived early enough to catch salmon for bait, although baits like squid, pilchard and trevally fillet should work, too. The trout fishing will only continue to get better as the days get cooler and Lake Purrumbete is the perfect place to focus on with brown trout being caught to 8lb and plenty of redfin. Lake Bullen Merri is out of action at the moment after a fish-kill event, so anglers should avoid fishing this water until fisheries have given it the all-clear.